Can someone else's past come back to bite you? After being drained of nearly all the blood in her body, novice witch, Portia Mullins, wakes up to find that her warlock boyfriend, Vance Mangum, has fled in search of his demon father. Determined to keep him from facing the evil alone Portia follows after him, unknowingly setting herself on the path of a new adventure that will take her, Vance, and their coven over international borders, into a foreign place where they will discover that the black magic which awaits them is far worse than they ever imagined. 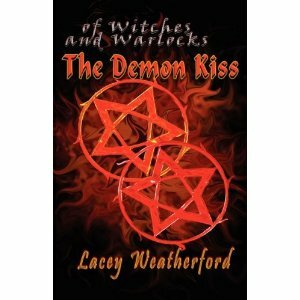 Portia finds herself tangled up in a web of lies and deceit in another's quest for demonic power in the excitingly romantic second paranormal novel in the Of Witches and Warlocks Series, The Demon Kiss. I was very excited to get my copy in the mail. I have been anxiously awaiting what's next in this new Paranormal Romance. I love a good love story. I'm a sucker for anything romantic. The Demon Kiss has loads of romance. I enjoyed the new twist in this next installment. I don't want to spoil it for you, but we learn more of Portia and Vance's powers, and we see some new additions to the coven! One thing I didn't really like was that Portia is engaged at 16 yrs old. I feel that is a bit young. Well a lot young. I didn't get married until 28 though, so who am I to say? I understand why they are engaged and their binding spell makes them even closer, but I still feel it would be a little more taboo than everyone was making it out to be. If you want something new, then try out this series. It is a nice twist on a romance with a witch and a warlock! I love me some of that Vance! I think because Lacey got married young and Kamery is getting married young it is something as normal for them. I think Portia is mature for her age and has been through a lot. She was reluctant but knows she wants to be with him. I like the fact they are so in love and committed so young.